On this page you'll find a selection of recorded trips (tracks). 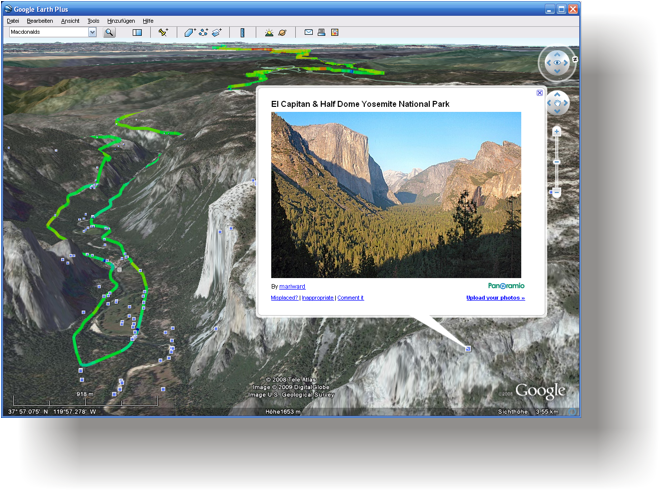 They were recorded with TerraTrack Recorder 7 and showed in the Google Earth at a desktop PC. As you can see the particular legs of track are showed with various colors, they mean the speed. The blue is slow, the green is faster, and the red is more faster. 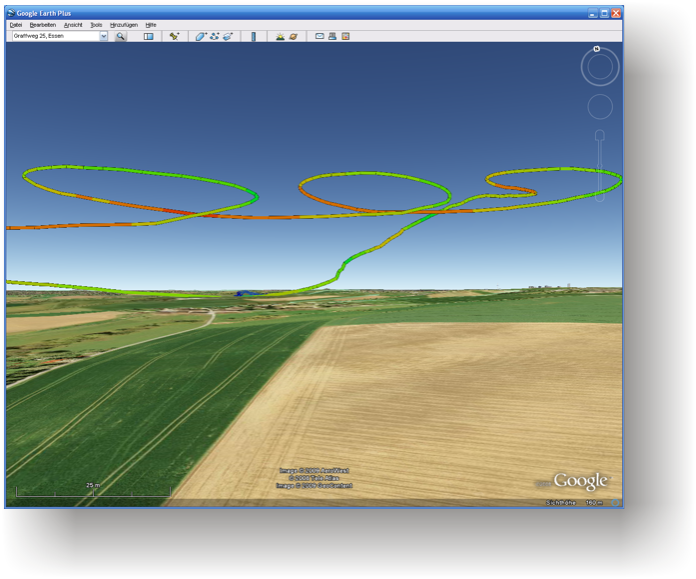 You could download the trip files then open them in TerraTrack Recorder 7 you will get a track curve, an altitude diagram and comprehensive statistics. 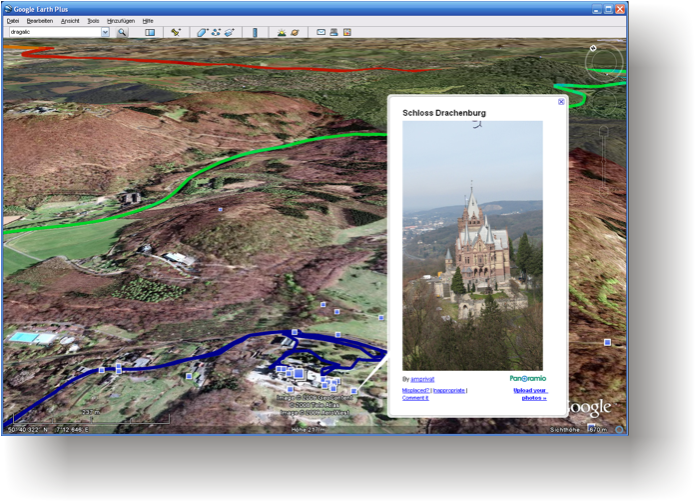 To show them in the Google Earth you want to save them in .KMZ files of Google Earth and open these with a click. 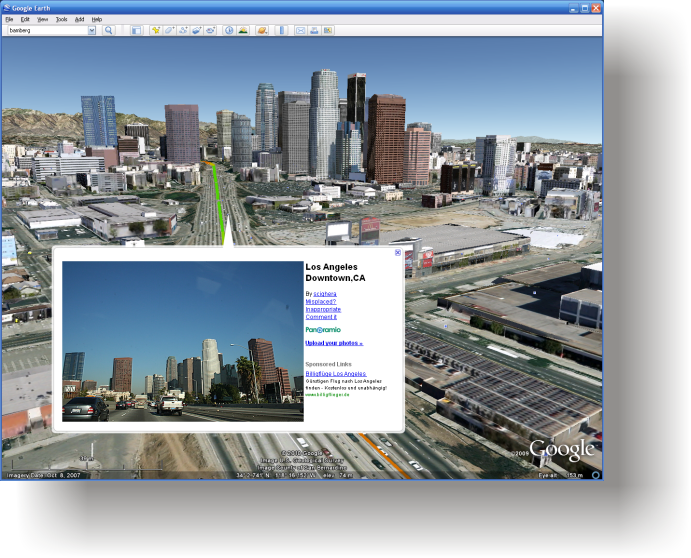 After that you can open it on your Windows phone using Google Maps Mobile or copy it to you desktop PC to open it in Google Earth. Downtown Los Angeles is the central business district of Los Angeles, California, United States, located close to the geographic center of the metropolitan area. The area features many of the city's major arts institutions and sports facilities, sightseeing opportunities, a variety of skyscrapers and associated large multinational corporations and an array of public art and unique shopping opportunities. Downtown is the hub of the city's freeway network and growing Metro rapid transit system. Though Downtown is generally thought to be bounded by the Los Angeles River on the east, the Hollywood (101) Freeway to the north, the Santa Monica (10) Freeway on the south and the Harbor (110) Freeway on the west, some sources, including the Los Angeles Downtown News and Los Angeles Times, extend the area past the traditional boundary to include University Park and Exposition Park encompassing the University of Southern California (USC) and Central City West neighborhoods. The converted in .KMZ file trip you could find here. Yosemite National Park is a national park located in the eastern portions of Tuolumne, Mariposa and Madera counties in east central California, United States. The park covers an area of 761,266 acres or 1,189 square miles (3,081 km²) and reaches across the western slopes of the Sierra Nevada mountain chain. Yosemite is visited by over 3.5 million people each year, many of whom only spend time in the seven square miles (18 km²) of Yosemite Valley. Designated a World Heritage Site in 1984, Yosemite is internationally recognized for its spectacular granite cliffs, waterfalls, clear streams, Giant Sequoia groves, and biological diversity. Almost 95% of the park is designated wilderness. Although not the first designated national park, Yosemite was a focal point in the development of the national park idea, largely owing to the work of people like John Muir and Galen Clark. Yosemite is one of the largest and least fragmented habitat blocks in the Sierra Nevada, and the park supports a diversity of plants and anim. The park has an elevation range from 2,000 to 13,114 feet (600 to 4,000 m) and contains five major vegetation zones: chaparral/oak woodland, lower montane, upper montane, subalpine, and alpine. Of California's 7,000 plant species, about 50% occur in the Sierra Nevada and more than 20% within Yosemite. There is suitable habitat or documentation for more than 160 rare plants in the park, with rare local geologic formations and unique soils characterizing the restricted ranges many of these plants occupy. 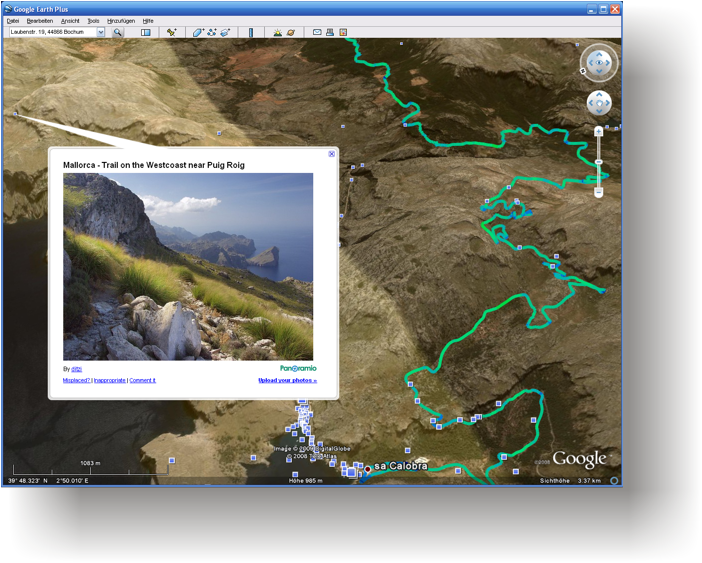 Sa Calobra is one of the most spectacular nature formations on the island. Here you find 3-400 meter vertical rock formations, a small beach and crystal clear water. To get there by car take the Soller Lluc road. You can also sail from Puerto de Soller along the coast, where there are several return trips daily. This trip is a classic. If you stay at a hotel, you can book this trip through the reception. If you stay privately, you can still book from a major hotels in the area. Sa Calobra has a large parking place, so you can take your own car as well. Some like to track up through the valley. It is not recommended to walk far unless you have planned the trip very carefully. Keep in mind that this small creek will change during rainfall, and become a very dangerous river very fast. Almost every year people lose their life being caught in the valley during sudden weather change. On the beach it is safe however. The Castle Drachenburg is a romantic work of art from the period of 1870 surrounded by the wonderful nature of the Siebengebirge, which is definitely worth seeing. The castle Schloss Drachenburg is one of the landmarks of the Siebengebirge. The Siebengebirge "seven mountains" is a German range of hills to the East of the Rhine, southeast of Bonn, consisting of more than 40 mountains and hills. It is located in Königswinter. It is of volcanic origin and came into being about 400 million years ago. Much of the territory covered by the Siebengebirge belongs to the Naturpark Siebengebirge, which is under environmental protection. In the fore-fortress the only "Museum for the History of Preservation of Nature" found a suitable place. Airport Data: Heliport, Mülheim-Ruhr 5km (3miles), Position 51°24´08"N, 006°56´14"E, Elevation 129m (423ft), Operating hours 06:00-22:00, 1 Passenger Terminal. The flight on a glider. How you will see the particular legs of track are showed with various colours, they mean the speed. The blue is slow, the green is faster, and the red is more faster.